President Obama will be hosting African heads of state in Washington, DC on August 5-6, 2014. Please find the Press Release (below) relating to the program in response to African Union’s request to organize an Africa Diaspora program alongside the US Africa Summit (document attached), which will be held on August 4-5, 2014. A central part of the program is the five African Union Diaspora Legacy Projects, which are of respective benefits to professionals, business owners, NGO operators, and members sending remittances to Africa. The respective workshops of choice are for individual participation at $35.00 per person, which includes lunch. You can learn about each of the respective AU Diaspora Legacy Projects and the opportunities by clicking on the link (below), which will give you the background and links to the details. Please, help in sensitizing the information to members in your communities and networks. If anyone is interested in coordinating an AU Diaspora Legacy Project Workshop, especially the African Professional Database and Africa Diaspora Development Market Place, or the African Institute for Remittances, they can send a direct mail to: africanservices@aol.com. We solicit the assistance of Friends of Sierra Leone in organizing the African Volunteers Corps. Invitations have been sent to all the African Embassies. It would be highly appreciated for members of the Sierra Leone and Friends of Sierra Leone community to help in organizing the Sierra Leone Showcase during the Vital and Vibrant Africa on August 4, 2014. This event is free to the public. Each of the African countries is respectfully expected to have at least a table of 10 at the African Union Diaspora Gala Banquet, which is $125.00 per person. Interested individuals or organizations can have distinguishable tables in their own recognizance or table signifying their mission. With faith in your leadership , we believe the Sierra Leone membership groups can identify at least 10 persons among the Sierra Leone population in the US who are able and willing to represent Sierra Leone or theSierra Leone Association(s) can sponsor the table for this historic occasion that honors the Congressional Black Caucus and formers peace corps members to African countries. One of the outcomes of the program is the documentation of socioeconomic developments that Africa Diaspora organizations are undertaking in Africa. Please, respective Sierra Leone associations may submit a summary of their mission and accomplishments, if applicable. Finally, the program is intended to facilitate the identification of capable leadership and the development of a consultative Diaspora organizational leadership for representation at the African Union Economic, Social and Cultural Council (ECOSOCC), which serves in advisory capacities to African presidents. 2o seats are allocated to the entire Diaspora out of the 150 seats at the ECOSOCC. This program will launch the African Union Diaspora Organizations as a structure for representation at the African Union and support among African organizations in the US. Those who wish to play leadership roles are welcome. These items are the main topics to be discussed during the conference call on Saturday July 5, 2014 at 1:00pm EST. Please, you can indicate your interests in participating in the conference call by replying to the email or by calling 240-706-6885. The conference call number will be given to the person(s). * Please distribute to various Sierra Leone cultural, national organizations, faith-based and alumni groups, members in the United States, and members of Friends of Sierra Leone. Africa Diaspora Leaders Announce a Unique African Union Diaspora Legacy Program alongside the US-Africa Summit. 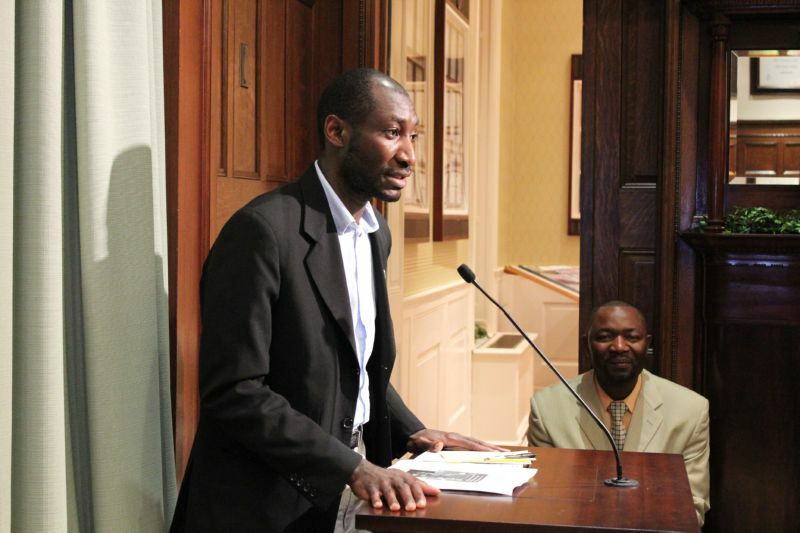 Councilman Edouard Haba, the first elected public official of African immigrant background in Prince George’s county, Maryland. He represents the 4th District in City of Hyattville Council. 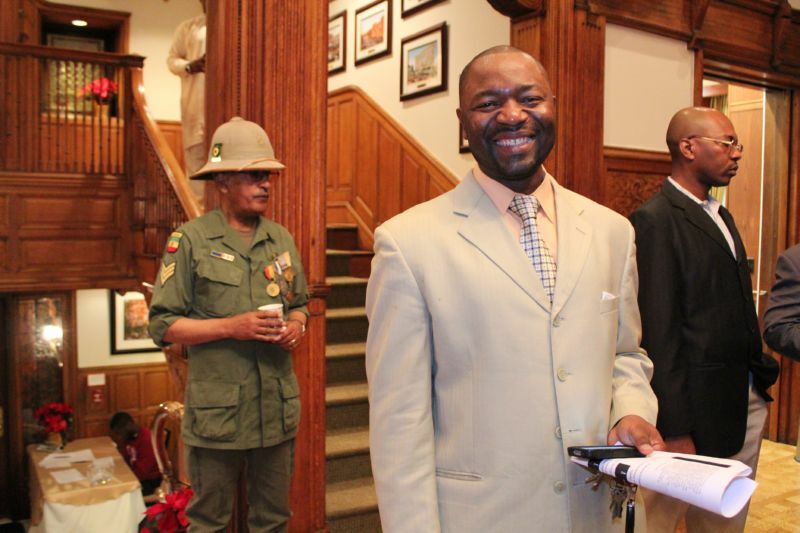 Councilman Haba is from Guinea. The African Union Diaspora Legacy Diaspora Program will take place on August 4-5, 2014 in the Washington Metropolitan Area. The multi-dimensional two-day program, entitled The National Summit on the Transformative Capacity of Africa Diaspora, is co-covened by a multi-disciplinary coalition of leaders of established organizations, businesses, and community organizers under a unifying umbrella of the African Union Diaspora Steering Committee and convened by I CAN DO. Notably, this initiative is undertaken in response to the official request by the African Union – Citizen and Diaspora Organizations Directorate for a proposed Africa Diaspora program alongside the US-Africa Summit. US President Obama will be hosting about 50 African heads of state in Washington, DC on August 5-6, 2014. The novel response by able and willing community stakeholders counters the erroneous public perception that the African immigrant community or people of African descent are unengaged during the US-Africa Summit. The organizers make it clear that it is not the duty of the US or African Union governments to organize the civil society. Rather, members of the civil society must effectively organize in order to reliably work in partnership with governments. The Africa Union Diaspora Legacy Program opens on Monday August 4, 2014 in Downtown Silver Spring, Maryland at the Civic Building and One Veterans Plaza. From 9:00am to 3:30pm, participants will attend a plenary session and simultaneous workshops on the five African Union Diaspora Legacy Projects. The five flagship Projects were adopted by member states in the African Union in 2012 to tap into the resourcefulness of its Africa Diaspora population by providing incentives to stakeholders in order to spur a range of socioeconomic developments, alleviate poverty, and promote initiatives that are aligned with a peaceful, prosperous and self-reliant Africa. This is the first time that the details, including the benefits and implementations, of all the flagship Projects will be discussed by a diverse assembly of stakeholders. Two special workshops on Youth and Food Security will also take place in collaboration with student organizations and agricultural organizations respectively. From 12:noon to 2:00pm, the Luncheon Conversation on the US-Africa Summit will highlight urgent issues in Africa and need for African governments to advance unified African agendas to foster Africa’s strategic interests beyond the Summit. From 11:am to 4:00pm at the same location, a complementary exhibition called Vital and Vibrant Africa will feature African countries with varied attractions and opportunities. Legendary depictions such as Timbuktu (a world center of learning by the 13th century) to ancient Egypt will promote education on Africa’s civilizations and influence on global systems. This thrilling One-Stop tour and learn about Africa and what she offers is open to the general public. No reservation is required. In community briefings Mrs. Jennifer Gray-Brumskine, a community organizer in the African community in New York, popular leader in the Liberia community in Staten Island, NY, founder of the Staten Island African Women Breakfast, and one of the coordinators of the African Union Diaspora Legacy Program, emphasizes the long-term impacts of each of the researched events and need to sensitize the dynamic developments in Africa, which are often unreported in the media. The series of events and approach demonstrate the increasing civic, economic, cultural, and social contributions of the new and emerging transnational, Continental African community to American and African developments. This population consists of African immigrants and people of African immigrant descent. Based on the US Census, Continental Africans constitute the most educated American population. Research by the World Bank and development institutions indicate that Remittances from Africa Diaspora to Africa, a conservative figure of $60 billion a year (half the actual amount) surpasses the combined cash-flow from the IMF and World Bank to Africa. Additional contributions from hometown, alumni and professional organizations range from micro-enterprises; social infrastructure developments such as building clinics, water projects, school; to direct scholarships and medical services. These account for another billions of dollars in development in Africa. The philanthropic endeavors are mostly unfunded by donor institutions and unsung in the public sector but they are revitalizing localities in Africa. The interconnectedness of stakeholders in the larger community of people of African descent, which includes African American and Caribbean communities, is reflected in the focus of the program. At 7:30pm the African Union Diaspora Legacy Gala Banquet will take place at the Hyatt Regency Hotel in Bethesda, Maryland. This is a White-Tie event with distinctive African flair characterized by African cuisine, fashion show, dramatic presentations and musical concert as the evening pays tribute to the Congressional Black Caucus; heralds the Legacy of Donald Payne Sr; honors Denise Rolark-Barnes, Publisher of the Washington Informer and also former Peace Corps members as a group that served in Africa. The theme of the night is Africa Unite, which celebrates the vision of Kwame Nkrumah and PanAfricanism. August 5, 2014 opens with Keeping It Alive: Run 2 Rescue to Bring Back Our Girls and Race 4 the Girl Child led by African Women groups from 6:00am to 9:00am. The empathy action lends support to the universal demand to spare no effort to find the girls, ages 15-18, who were kidnapped from their boarding school in Chibok, Borno State, Nigeria by the Boko Haram terrorist sect on the night of April 14-15, 2014. The event also calls attention to the welfare of young girls in Africa, especially their right to education. The Interfaith Prayer Lunch from 12:00pm to 2:30pm promotes harmonious relationships among the diverse mosaic of our global community, including people of varied religious and cultural backgrounds, in order to mutually confront and resolve crisis. This event is co-convened by faith-based leaders. The last event of the Africa Union Diaspora Legacy Program is the Africa Diaspora Roundtable on Partnerships and Collaboration from 6:30pm to 9:00pm. It brings together Africa Diaspora organizations and community organizers from the Five Regions of Africa and the Sixth Region to foster goodwill understanding of the diversity of constituent orientations, interests, and priorities and to explore effective methods to generate support for common cause. This is the first time a substantive dialogue will take place among the divergent populations with grassroots inputs, which will assist the African Union in making informed decisions. The 2-day program energizes civil society actors from all sectors to engage in discourse and actions that reflect success stories, highlight challenges, and opportunities to provide solutions. The flagship Projects are the only formal vehicles that all the African governments are committed to accountably include stakeholders living outside Africa in Africa’s developments. An all day-long workshop is designed to comprehensively discuss and analyze the respective African Union Diaspora Legacy Projects: 1) African Professional Data Base; 2) African Development Market Place; 3) African Institute for Remittances; 4) African Investment Fund; and 5) African Volunteers Corps. In the interactive workshops, participants will address the contents, process and benefits, network and recommend solutions for effective implementations, monitoring, and accountability. The Youth workshop is organized by youths for youths to appreciate their role in African development and preserving the African culture and identity. The Food Security workshop brings together experts and partners to explore creative ways enabling economic growth, increase incomes, reduce hunger and poverty with particular focus on small scale farmers and women, and support for local-led priorities from the public sector and private sector donors. The Food Security workshop is aligned with the African Union declaration of 2014 as the Year of Agriculture and Food Security in Africa and the Comprehensive Africa Agriculture Development Program. The African Union Diaspora Steering Committee and I CAN DO will submit outcomes of the African Union Diaspora Legacy Project Workshops to the African Union – Citizen and Diaspora Organizations as recommendations to the Technical Review Committee on the flagship Projects. At the planning conference Mr. James Atanis, one of the Presidents of the Nde coalition of associations in the Cameroon community and coordinator of the Africa Union Diaspora Legacy Program, explains that the program’s strength, authenticity, and long-term sustainability are based on the self-reliant approach. This is a welcome departure from dependency syndromes when programs with great promise cease to operate because external grantors no longer fund the programs. Groups from all the Five Regions in Africa and also the Sixth Region, a status accorded by the African Union to include all people of African descent, are participating in the program. In his keynote address at the launching of the African Union’s Economic, Social and Cultural Council (ECOSOCC) in 2002, President Kikwete of Tanzania noted that “with the establishment of ECOSOCC we are creating a people-oriented, people-centred and people-driven community in the African Union in which all stakeholders are effectively represented.” Consistent with this ideal, the collaborative orientation of the African Union Diaspora Legacy Program facilitates evidence-based representations and advisory roles to African governments through the African Union’s ECOSOCC, which specifically gives civil society organizations a voice within the African Union institutions and decision-making processes. Mr. Tegi Obanda, the Vice President of Kenya Diaspora Leadership Assembly and coordinator of the Africa Union Diaspora Legacy Program, reiterates the need for the diverse representation from all sectors of the civil society, from the grassroots to thought leaders, as a new way forward. The broad outreach ensures inclusion of demographic groups that are usually left out of policy deliberations and decision making processes. Bringing all into the fold enables the African Union to make better decisions as opposed to relying on the views of the familiar few or opinions of major institutions that do not necessarily have direct relationship with, and working knowledge of, stakeholder communities and grassroots organizations. Mrs. Mariama Sire Dione, a UNESCO Ambassador for Peace, member of Africana Women Working Group at the UN and Commission on Status of Women, Co-founder of the Africa Day Parade, Founder of African Women for Good Governance is one of the coordinators of the African Union Diaspora Legacy program with an abiding passion and focus on women and the girl child. A native of Guinea, she explains the need for society to embrace the changing role of African women as multi-talented contributors in all facets of development and leadership, and to dispel stereotypical perceptions. The program offers opportunity for African women organizations from all over the US to network and develop proactive agendas to remove barriers to personal enhancement, entrepreneurial, professional, and leadership excellence.